This page should allow any Alfa Romeo 2000-2600 Spider owners or enthusiasts a quick and easy reference and a place to share pictures of Alfa Romeo 2000-2600 Spider 's. Technical specifications are also listed on this page as are Alfa Romeo 2000-2600 Spider 's for sale, Alfa Romeo 2000-2600 Spider spare parts and Alfa Romeo 2000-2600 Spider books and memorabilia. If you cannot find what you are looking for on this page then feel free to use the Goggle Search feature below to search the web for more Alfa Romeo 2000-2600 Spider information. 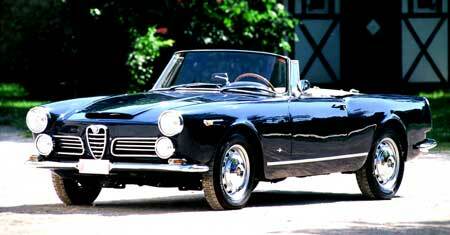 As part of the new 2600 range, Alfa Romeo launched its new 2600Spider in 1962. The Spider used a unique two door, 2+2 open body and featured distinctive, "stacked" headlamps giving it a prestigious appearance. As with the other 2600 models the Spider used the new 2584cc, twin overhead cam six cylinder engine.